KNLUNKERKRANICH ROOF - YOUR SUMMER DRINK IS SHARP READY. A nice 80's Blue jeans morning surprise, SARA MESSENGER - NY, will join the Sunshine Jazzy, Yeah!. Speedy Boarding tickets/ safe tickets, and tickets for the Falafel opening party are - sold out! 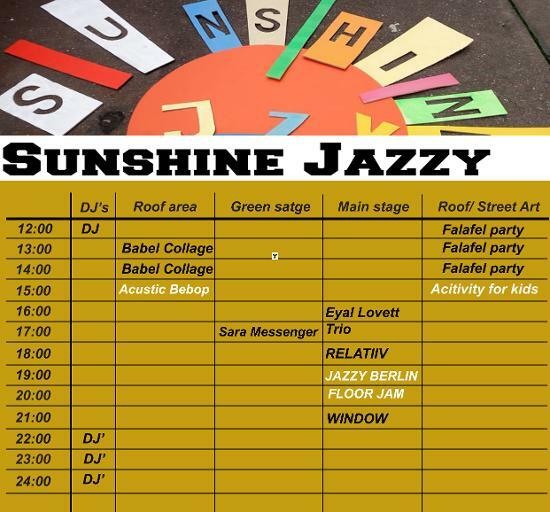 Lionel Haas- Carmelo Leotta - Braien D.
Celebrating its 5th year in 2017, the independent Jazzy Berlin Community will open the 1st festival ''Sunshine Jazzy'', presenting new Soul/ Hip Hop/ Be Bop bands over the course of one summer day in Berlin. The location is - Klunkerkranich rooftop. Since 2012, starting at Katerholzig Jazzy inspired and being inspired by multi open minded fans and musicians, and has consistently proven to be one of the most welcoming, down to earth, comfortable, fair priced, with his rewarding Tuesdays ''New Jazzy Berlin Jam Session Experience'' nights. Jazzy had a dream, to bring Jazz to all, starting with 40 people around the bandstand and now with hundreds of people, celebrating the New 2017 Live Jazzy vibes. Jazzy Berlin is located at the Klunkerkranich as part of the Neukölln neighborhood. We commit to always keeping ticket prices low, providing a fair good experience. Jazzy Berlin has only one sponsor - his fans and listeners. 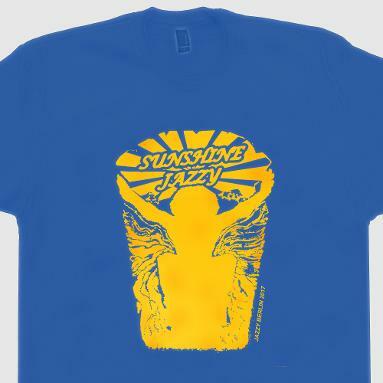 Dear Jazzy fans - You are invited to the Limited exclusive OPENING party with Free falafel, Jazz Sun and a good time. APPLICATION FOR SJ 2017 IS OVER. SEE YOU NEXT YEAR. Jazzy Berlin except applications from Local (Berlin Based) Soul/ Hip Hop/ Jazz band and single artists. From Juli 1st to latest 1st August 2017 for Jazzy Berlin fest 13.8.2018. Contact details should including name, location, e-mail address & phone number. After the meeting of the program adviser, you will receive a message by e-mail, at the latest by the end of this month. Paid Artists means: Less options to be booked due to main stage open spots. But we still have open spots! Band get paid - info via mail, Entry free, Food and drinks, no travel expenses. Applicants are expected to receive a message by e-mail in 2 weeks. Application "On the green stage / Free Stage"
Free Stage means: More options to be booked due to out door stage open spots. 3 free guests tickets, band entry free, Food and drinks, no fee, no travel expenses. Applicants are expected to receive a message by e-mail in 2 weeks.